One can hardly see me joining any gathering or reunion of school mates, there were many of such occasions that I did not make any effort to join, but it was a different case when my childhood friend, Susan, came back from the U.S. last month. I got to meet her before she goes off again. 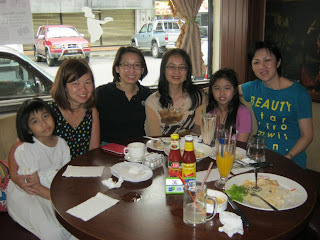 We have not been seeing each other for more than 5 years since the last time she came back to KK. We are close friend since primary school, her parents have been very consistently bringing me to church every Sunday when I was still a teenage girl. They were like God sent guardians to me. 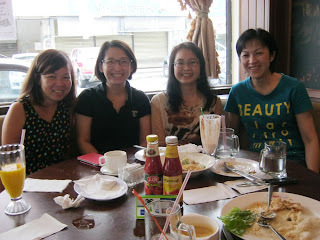 Due to her busy schedule during the last 3 weeks in KK before she went off to Ipoh (much nearer to home this time), we managed to get together for yam cha on a Sunday afternoon, 8th July 2012, together with our old time friends, Vivien & Eliza. I tagged along my 2 little princesses to meet the aunties. They got bored and misbehaved a little while the mummy & aunties were busy chit chatting, catching up with each other on the past & present :DDD. It was a great get together, looking forward to our next gathering again during this coming Chinese New Year. After near 5 years of working in the company, my colleague, Rosalind, has finally called it a quit and to start their family business. I guess she must have thought it over and over again before making a decision, it is not easy to come out from the comfort zone and go into the unknown, especially to venture into a new business. We had a farewell dinner for her at Promenade hotel last Friday, it was heavy downpour that evening, we nearly postponed the dinner, glad that we carried on as planned. The weather in KK has been unpredictable, it hard to find a fine day for the occasion. The buffet dinner was superb that goes well with the company of our colleagues, it is our good gesture to wish Rosalind succeeds in her future endeavors.